Admittedly I am a craft and cardmaking supplies junky! But Inks, paint, and ink pads are amongst some of the most highly coveted items for me. There are SO MANY different styles, colors, and even textures of different inks and paints! You can find inks in the familiar form of markers and pens, but also in neat little bottles that remind me of little nail polish bottles with the most vibrant of colors. Then there's the pains, from glossy beautifully colored craft paint, to paints that are meant to give texture or an antique finish, such a s crackle paint. And the ink pads! Oh my! Every color of the rainbow, and textures from standard dye based ink, to chalk ink pads, to metallic and pearlescent. Accent Inks - These are the little ink bottles that resemble tiny nail polish bottles. These inks are meant for adding small accents and details to your handmade invitations or cards. Alcohol Ink - Alcohol ink comes in a small dropper kind of bottle. Use alcohol ink on slick paper and surfaces. It is transparent but very vibrant, and creates a beautiful polished stone effect. Spray Ink - these inks come in a spray bottle. Simply spray the ink straight onto the paper or object you intend to apply color too. One of my favorite spray inks is Tattered Angels Glimmer Mist. It creates a fabulous luminescence to your paper. Acrylic Paint - Acrylic paint is a water based paint so it is easy to clean up and it is very versatile as well. These are pretty much regular craft paints but come in small bottle with different finishes like glossy or matte. Crackle Paint - This paint is cool stuff, and can be used on paper, cardboard, chipboard, and even wood and similar items. When dried it gives the appearance of distress and age. 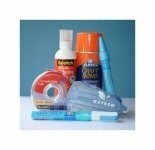 Glitter Glue - Yes I know, glue is not exactly glitter, but glitter glue is used exactly in the same way as paint is when using as cardmaking supplies, so I am listing it here. You can get glitter glue in little squeeze bottle in just about every color imaginable. A very cool effect to add some bling or creative accents. Acrylic Paint Dabbers - Paint dabbers are like the equivalent of if you could put actual paint into an ink pad. The top of the paint dabber has a little pad in which to "dab" the paint straight onto a rubber stamp. Very nifty! Stamp Pad Ink - There is a lot more to the good old rubber stamping ink pad than there used to be. These days if you head into any arts and crafts or cardmaking supply store, you will find quite an array of different stamp pads! They will don several different types of inks, but also come in several different shapes, and in about every color of the rainbow. There are small ink pads, big ink pads, ink pad set that fit together almost like a puzzle, and even tear drop shaped ink pads. Chalk - Yes you can get ink pads that have a chalk like ink within them. These are great for adding texture to the edges of a card, or simply giving a card or stamped image a nice soft ink application. I really love using them with stencils as well. Distress Ink - Distress ink is generally applied straight to the paper without using a stamp to apply an image, although I have used distress ink with a stamp as well. You can apply it to the edges and surface to give the paper an old antique feel, or simply add some depth and texture. 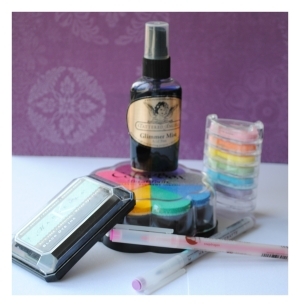 Embossing Ink Pads - Embossing ink and powders are used to give an image or type that raised off teh page look. You apply it to a page with the aid of a rubber stamp and then apply a heating tool. The heating tool will transform your stamped image or text into not only a raised image, but with a smooth glossy feel.